Most people's idea of a relaxing bath would probably consist of good music, a few lit candles and the perfect water temperature to shake off the rust from another day. However, this may not be good enough for some upscale bathroom shoppers, who are looking for the ultimate experience during each dip in their tub. 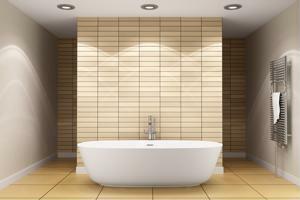 According to Engadget.com, these remodelers may have found their muse in the Kohler VibrAcoustic system. Unlike the standard whirlpool, this bathtub and shower system is meant to envelop the senses in music, decorative lighting and pulsating massage to make each bath the ultimate relaxation experience. According to the Hindustan Times, the setup comes with a Bluetooth-enabled touchscreen device that is mounted to the side of the tub. This can control music wirelessly or through a hardware connection and will actually sync the massage up to the rhythm of the music. The bathtub is also aided by chromatherapy lighting, which also matches up with the beat of the music to provide a calm and soothing environment. Users can also change the color scheme of the lights to suit their mood, but it's often better to see how close the music can sync up with your lighting scheme. The sensation of vibration permeating the water, in tandem with the music and lighting is unlike anything in the world of modern bathroom design. Perhaps one of the coolest features of the VibrAcoustic system is the 88-inch with an overflow drain that can be placed on either side of the tub. Now if you really want to take a dip underneath the water, any excess will be caught by the drain. Doing that in a standard bathtub is never something you'd do unless you'd like to mop your floor, so Kohler has truly gone above and beyond to tailor to the whims of its consumers. While you can certainly listen to your own music in the tub, Kohler has enlisted the help of sound specialists to create four pre-loaded tracks that is meant to time your breathing with the beat and chord progression to help you calm down and de-stress. If you have the money to burn on one of these cutting-edge bath systems, this is by far one of the most innovative products on the market. Is this design your dream bathtub, or does it have too many bells and whistles?